Hopefully everyone is familiar with the four rules of firearms safety. Rule one is typically some form of "all guns are always loaded" and we should respect and remember those rules at all times. In this case, when I say "always empty" I'm referring to a revolver's limited ammunition capacity and the constant need to reload. At best you have eight rounds, or at worst five, in the cylinder. With an average of six rounds on board, the revolver is a low capacity arm. So what does that mean? Well, it means you better learn a technique to reload your chosen wheelgun because that small handful of rounds sure goes quick. 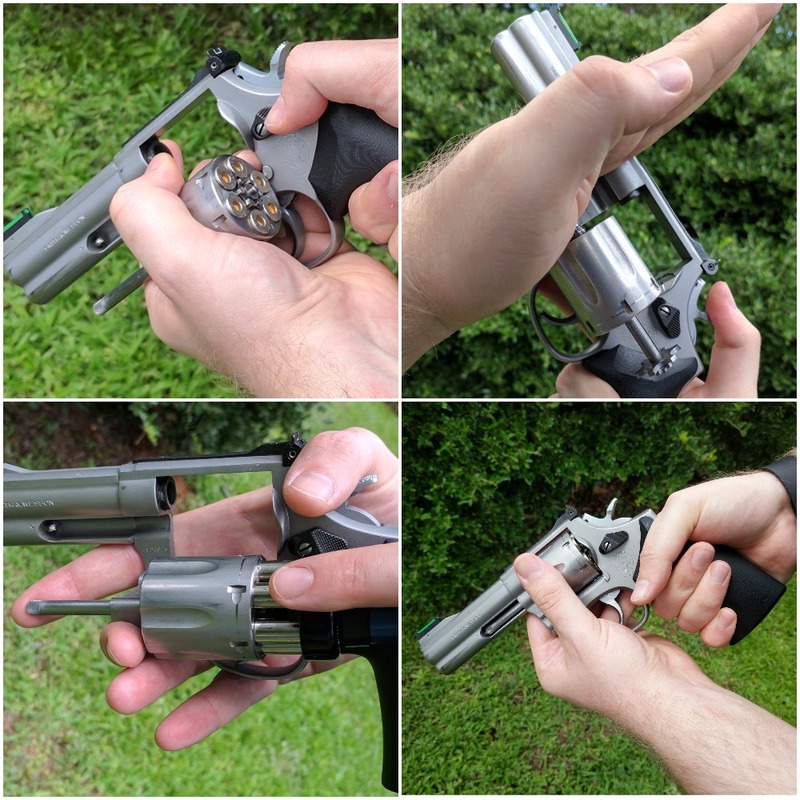 When I first started shooting a revolver, I used the techniques I saw others using in person at matches or online in videos. Quick side note - The best video teaching various reloading techniques I've located was produced by Lucky Gunner located here: Lucky Gunner: How to Reload a Revolver. Keep in mind: I am in no way affiliated with Chris and the Lucky Gunner team, but they produce some amazing content and I am thrilled when a new article is published. I'd like to address the different methods of reloads that I slowly worked my way through before finally settling on a left hand friendly reload that I use 90% of the time. Why only 90%? More on that later. From my research, there are a few standardized techniques for reloading revolvers. All assume a right handed shooter referring to the right hand as the strong hand and the left hand as the support hand. I've also heard strong and weak but support sounds better. I quickly learned the Universal reload but transitioned to the FBI/Competition reload purely for the slight increase in speed before finding a suitable left handed reload. 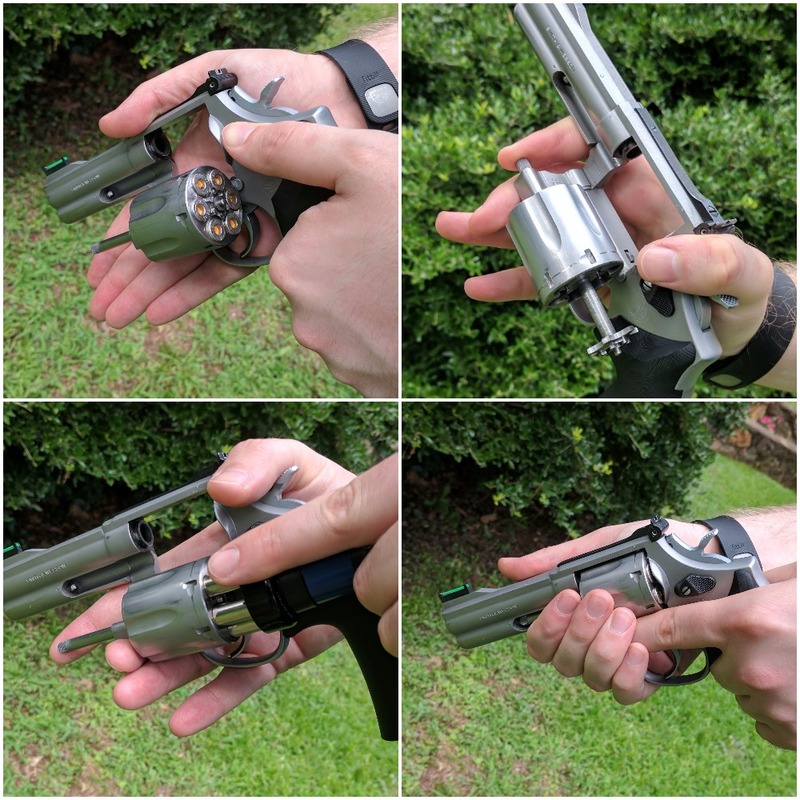 Universal: The revolver transitions to the support hand while orienting the muzzle upward and the strong hand hits the ejector rod with the palm/heel of the support hand, ejecting spent brass. The strong hand then retrieves the speedloader or moonclip while the support hand reorients the revolver toward the ground. 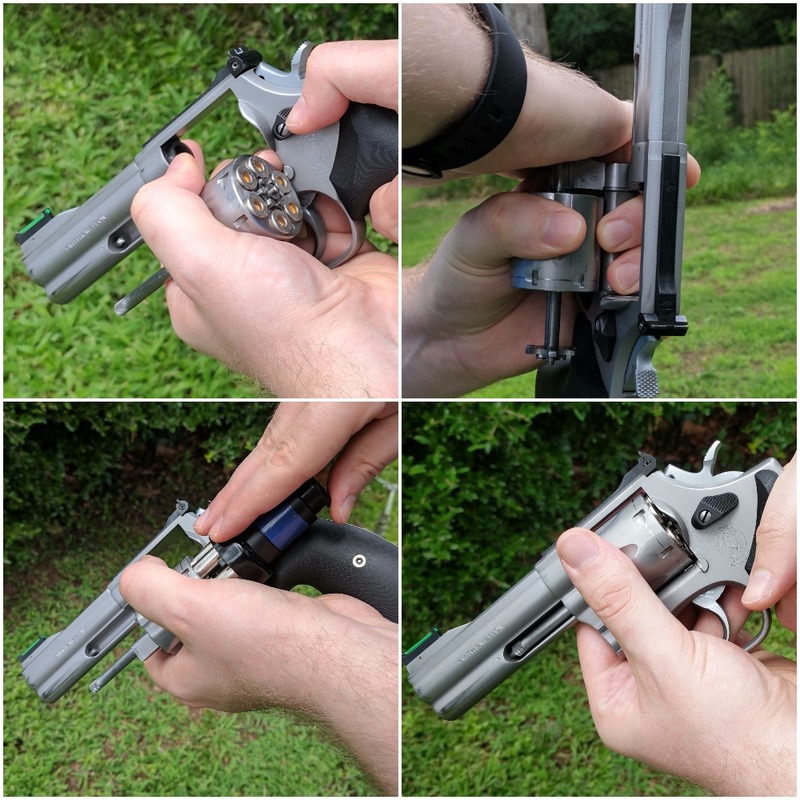 The rounds go in, the support hand closes the cylinder, and the revolver reorients toward the target. FBI/Competition: The revolver transitions to the support hand, while orienting the muzzle upward and pumps the ejector rod with the support thumb, ejecting spent brass. Meanwhile the strong hand retrieves the speedloader or moonclip while the support hand reorients the revolver toward the ground. The rounds go in, the support hand closes the cylinder, and the revolver reorients toward the target. As my focus on the revolver increased, I started watching more match footage and noticed many of those competitors did not transition the revolver to the support hand at all. The strong hand controlled the revolver while the support hand ejected the spent casings (typically moonclips) and then performed the reload. This seems to be the norm but since I shoot left handed, I tried it a few times but quickly moved on to left hand specific reloads. Support Hand: The revolver remains in the strong hand and while orienting the muzzle upward, the support hand strikes the ejector rod with the palm/heel of the support hand. The support hand then retrieves the speedloader or moonclip while the strong hand reorients the revolver toward the ground. The rounds go in, the support hand closes the cylinder, and the revolver reorients toward the target. As I mentioned before, I learned several right hand reloads because the majority of shooters are right handed. It was only after watching left handed shooters on the internet that I even saw a left handed reload. I noticed a shooter named Ken Ortbach was reloading with his left hand. I watched most of his match videos and started working on this reload. His technique opens the cylinder with the left thumb, transitions the revolver to the right hand with the thumb through the frame pinching the cylinder. The strong hand retrieves the speedloader or moonclip, reloads, and reestablishes the left hand grip. I tried the Ortbach reload several times but it didn't feel quite right. Online users recommended the Matt Griffin reload. I was almost using the Griffin reload except my thumb sits between the hammer and the rear sight. This reload appears to work relatively well. I also learned a technique from Wayne Dobbs at Hardwired Tactical's revolver seminar. 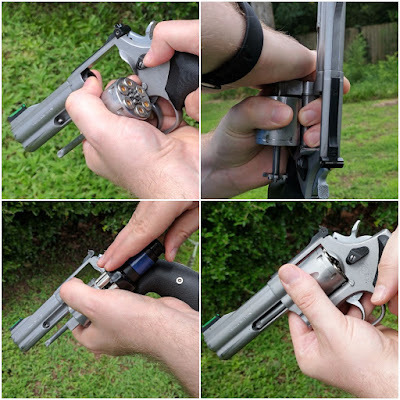 The Dobbs reload that placed the revolver further into the web of the support hand which allows the thumb to reach over the frame to pinch the cylinder which prevents cylinder rotation. As the wheelgun is deeper into the hand, this reload is more secure. Left Hand: The revolver transitions to the support hand resting on the fingers while the thumb is placed on the hammer just behind the rear sight. After orienting the revolver upward, the support index finger pumps the ejector rod sharply, ejecting the spent brass. The strong hand retrieves the speedloader or moonclip while the support hand reorients the revolver toward the ground. 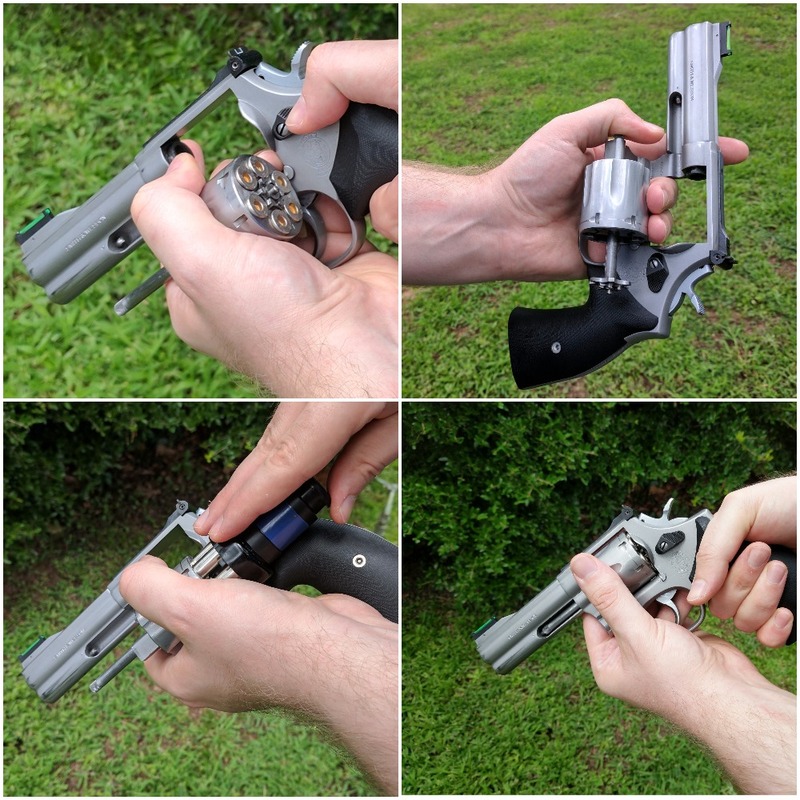 The rounds go in, the support hand closes the cylinder, and the revolver reorients toward the target. At this point, I have decided that the majority of my reloads will be strong hand rather than support hand. That doesn't mean I have neglected my practice of the support hand reload entirely. For reloading revolvers with shorter ejector rods, I still find the Universal reload for positive extraction. The firm strike ejects all the brass with greater success than the FBI/Competition reload. Additionally, a recent IDPA match I attended included a significant of left to right movement while reloading. In the interest ensuring the muzzle remained in complete control, I reverted to a support hand reload when moving to the right at any reasonable speed. The rest of my reloads were completed with my left hand reload. I might amend the technique in the future. I worry that the front of the cylinder might become hot to the touch under extended firing but so far so good.